The N.C. Labor Laws Poster (Spanish) is a general labor law poster poster by the North Carolina Department Of Labor. This is a mandatory posting for all employers in North Carolina, and businesses who fail to comply may be subject to fines or sanctions. This poster, written in Spanish, must be posted in a conspicuous place where all Spanish speaking employees will see it. This poster describes what the minimum wage is as well as how overtime must be paid as well as exemptions to minimum wage and overtime. This poster also describes the requirements and restrictions minors have for employment with regards to hours possible that they can work and where they can and cannot work. Also described is when regular wage payments should be and where to file complaints if any violation of this law occurs. This law also discusses health and safety laws and what employers must do to follow the standards of the state and how the state deals with penalties to employers who do not follow health and safety standards. It appears you don't have a PDF plugin for this browser. 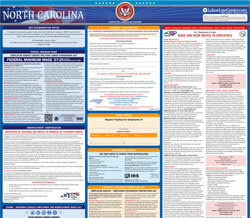 Please see the link below to download north-carolina-labor-law-poster-spanish.pdf. nuestro sitio de Internet:  www.nclabor.com. nuestro sitio web en  www.nclabor.com. Día del Trabajo fuera de los días escolares). tad por cualquier razón o sin ninguna razón en absoluto. gura o accidente deben ser completadas sin demora. laciones después que pasó el plazo acordado. con “violaciones repetidas” en un lugar de trabajo. en relación a citaciones, períodos para efectuar correc ciones, y multas. Dentro de las ocho horas: Cualquier fatalidad en el lugar de trabajo. •Cualquier amputación en el lugar de trabajo.•Cualquier pérdida de un ojo en el lugar de trabajo. También, se puede usar el sitio de Internet: www.nclabor.com. Coloca  La Noticia de OSH para los Empleado s junto a Pagos y Horarios: Noticia a los Empleados. ctual del formulario 17, visite www.ic.nc.gov.